So glad you stopped by today! 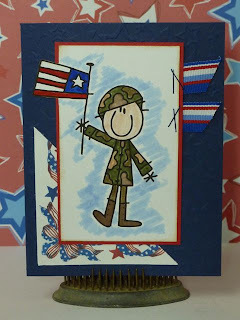 This week's FCCB challenge is to create a project that celebrates Memorial Day. I am so honored to be able to use one of our fabulous sponsors images, Bugaboo Digi Stamps. 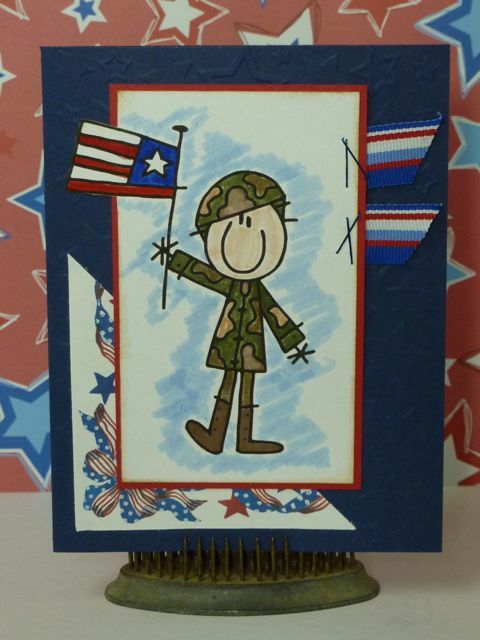 I tried my hand at using my Stampin' Up markers to color in this patriotic soldier. The base card is an A2 dry embossed with the Darice Stars Assortment folder. The ribbon is from my stash. The corner was cut using Straight From The Nest out of paper from my stash. Love, love, love this image! Fabulous card! Great card Tammy, that is the cutest little image!! Happy Memorial Day!!! Such a fun image! I loved it.